Union Ridge Elementary is promoting literacy in a big way! All Ridgefield students in Grades K-6 and their families are invited to Family Literacy Night on Monday, November 5 from 6:00 pm – 7:30 pm to take part in some fun activities supporting literacy. 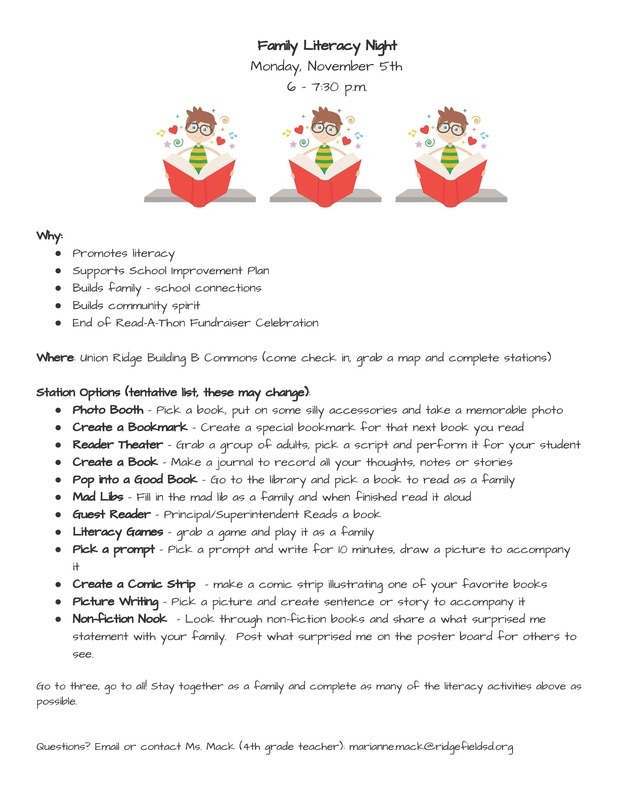 Check in at Union Ridge Building B Commons to get a map and handout, then together as a family, complete at least three activities or as many as possible by visiting various literacy stations in the school. Go to three or go to all! Questions? Email or contact Ms. Mack (Union Ridge 4th grade teacher) at mariannemack@ridgefieldsd.org.